I tried on the new Define today in Wish Blue and Pig Pink and I have to say I’m officially in LOVE with Wish Blue. I didn’t think I would love it this much but it looks so gorgeous on. Not at all close to Little Boy Blue. Very vibrant and electric. I was so close to buying the Define just for the color but stopped myself because the shape is not great on me. I really hope Stride II comes in Wish….do you hear me Lulu? I know your reading this! As for the zipper, it’s not rubberized but it has that look. The teeth are thick chunky plastic and the toggle part is metal and no hair elastic. I think it looks good in the Wish blue but I don’t like the strong contrast on the Pig Pink so much. 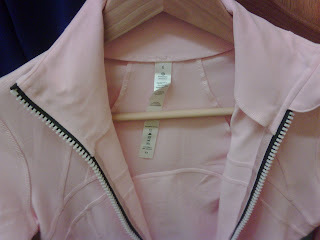 I also made sure to catch the inside of the collar on the Pig Pink picture because I know some of you don’t like the flap of fabric on the inside and where wondering if that had been changed. "Look at how pretty Wish and Electric Orange look together." looks like the dreaded "collar flap" still flaps! 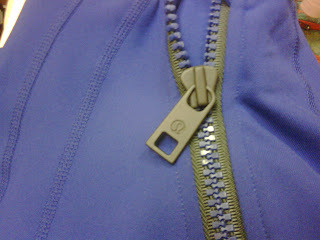 what color is the zipper on the wish blue define? pea green? Grey but possibly a little bit of a green undertone considering the picture. in person it just looks grey.